Similar to a tortilla, a chapati is an Indian staple that doubles as a utensil at meal time to scoop up curry and other dishes. Made from wheat flour, chapatis are thin, unleavened breads cooked over a griddle until lightly browned. While traditional chapatis never contain eggs, when added to the dough, egg provides a slightly fluffier consistency to a chapati and other similar breads. Chapati is most commonly made using a whole grain flour such as wheat along with water and salt. To make this simple bread, mix the ingredients until they hold together and work the dough with your hand until it forms a smooth ball. Place the dough in a bowl, cover it with plastic wrap and allow it to rest for at least 45 minutes. Shape the dough into small golf ball-sized rounds and then roll each into 1/8 inch thick circles using a rolling pin. Cook the dough in a hot skillet, flipping once until browned on both sides. While egg is not typically added to chapati flour, it is occasionally added to the similar roti bread, another almost identical Indian unleavened bread that contains wheat flour, salt and water as well as oil, which creates a slightly smoother textured bread. When eggs are added to flour for either bread, it gives the finished breads a fluffier texture. While not always so, roti is sometimes made using egg in the dough. The addition of oil in roti gives it a subtle difference and creates a slightly more pliable bread. When you add egg to the dough, it becomes more springy. Roti is made in the same way as chapati by mixing wheat flour, salt, oil, water and possibly egg until they form a dough. Shape the dough into a ball, place it in a bowl, rub it with oil and cover it to rest for two hours. Roll the dough and cook it on a griddle in the same way as chapati. Egg chapati is the most common way that eggs are cooked with chapati dough. Called a chapati omelette, the chapati dough is cooked separately without the inclusion of eggs and then the eggs are added and cooked onto a chapati. 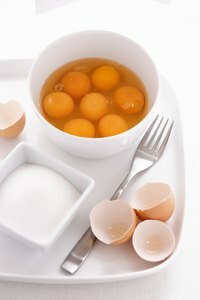 Beat one egg per chapati in a separate bowl and lightly season it with salt. Roll and cook chapati bread as usual over a griddle and when the second side of the chapati is nearly cooked, pour the egg mixture over the chapati and top it with diced red onions if desired. As the egg begins to set, loosen it around the edges with a spatula and flip the chapati. Finish cooking it until the egg is completely set. While the egg and chapati are not mixed together, like in a roti containing egg in the preparation, the inclusion of egg makes for a denser and heartier snack or light meal. Chapatis can be stuffed with different ingredients, however they are no longer called chapati once stuffed, but instead paratha. One common way to stuff paratha is with oil or clarified butter, called ghee, and then cook it with eggs, in the same way as an egg chapati. The dough of paratha is prepared in the same way as chapati and rolled out into rounds. Drizzle the round with oil or ghee, fold it in half, drizzle it again, fold it half again until it forms a triangle and roll it out into a round again. The oil is not worked into the dough as when making roti, but instead the bread is wrapped around it, forming tiny pockets of oil or ghee that are noticeable when eating, especially when prepared simply in an egg paratha. Cook the paratha in a griddle until browned on both sides, top it with beaten, seasoned egg and cook it until the egg is set, flipping it once the egg is solid enough to do so. Though very close in character to an egg chapati, an egg paratha offers pockets of warmed oil that, when mixed with the egg, make for an even richer, savory meal.